For as long as we have been researching human memory, psychologists have been investigating how people remember and forget. This research is regularly drawn upon in our legal systems. Historically, we have relied upon eyewitness memory to help judge responsibility and adjudicate truth, but memory is malleable, prone to error, and susceptible to bias. Even confident eyewitnesses make mistakes, and even accurate witnesses sometimes find their testimony subjected to harsh scrutiny. Emerging from this environment, the Cognitive Interview (CI) became a means of assisting cooperative witnesses with recalling more information without sacrificing accuracy. First used by police interviewing adult witnesses, it is now used with many populations in many contexts, including public health, accident reconstruction, and the interrogation of terror suspects. 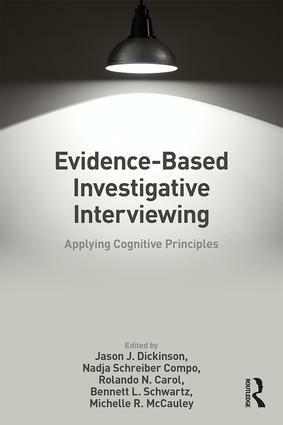 Evidence-Based Investigative Interviewing reviews the application of cognitive research to investigative interviewing, revealing how principles of cognition, memory, and social dynamics may increase the accuracy of eyewitness testimony. It provides evidence-based applications for investigators beyond the forensic domain in areas such as eyewitness identification, detecting deception, and interviewing children. Drawing together the work of thirty-three authors across both the academic and practice communities, this comprehensive collection is essential reading for researchers in psychology, forensics, and disciplines such as epidemiology and gerontology. Jason J. Dickinson, Ph.D., is a professor of psychology and the Director of the Robert D. McCormick Center for Child Advocacy and Policy at Montclair State University. Rolando N. Carol, Ph.D. is an assistant professor at Auburn University at Montgomery. Bennett L. Schwartz, Ph.D., is a professor of psychology at Florida International University. Michelle R. McCauley, Ph.D. is a professor of psychology at Middlebury College.